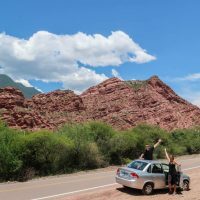 When planning our travel route around Argentina, our eyes were continuously drawn to the northwestern province of Salta, which is bordered by Chile, Bolivia and Paraguay. With so many countries edging this province, we knew it would be an interesting, culture-rich region to visit. We arrived in Salta city late at night hungry and tired after our journey from Montevideo. 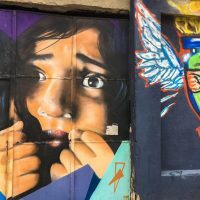 Even though it was dark outside and we were in desperate need of a meal, our spirits were high and our first impressions of Salta were very positive. We were literally at the door to our posada when we realized that we didn’t have any Argentinian pesos in our wallet to pay for the taxi ride from the airport. 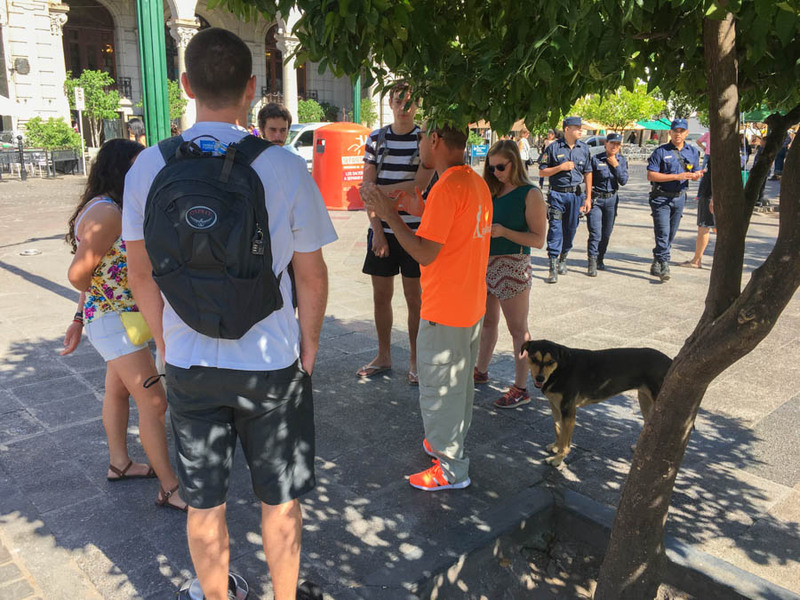 We explained to the driver that we had no money and he suggested driving us to an ATM, but instead he waited patiently while Nick asked the posada owner if we could borrow some money. The driver was friendly and chatted with me while Nick was inside. 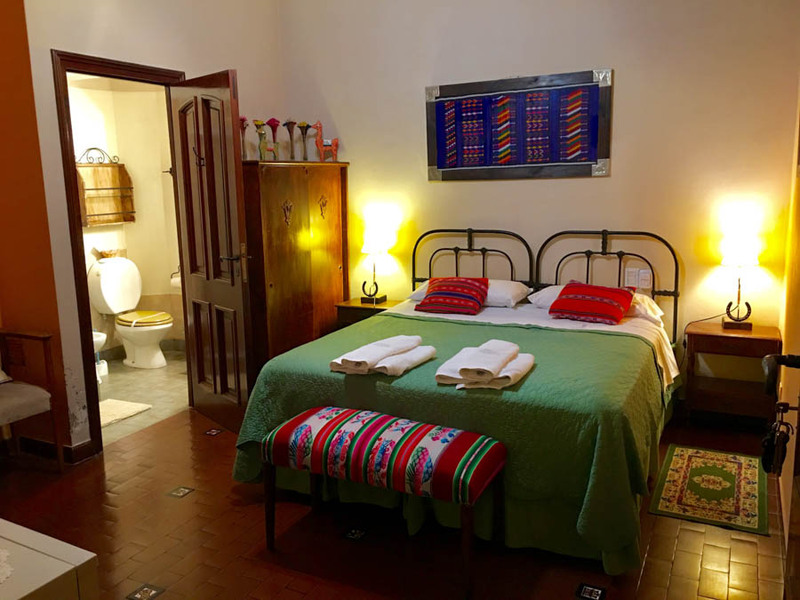 This was our accommodation during our stay in Salta, Posada del Angel. We loved it! Returning empty-handed from the posada (with apologies from the owner), we resorted to offering the driver US dollars – a currency that we always carry. Expecting a rip-off exchange rate, we held our breath as we handed over the $20 bill. To our surprise, the driver actually gave us a better rate than we expected, gave us our change back, and shook our hands goodbye. Having a positive experience with a taxi driver doesn’t happen all that often. This was our first encounter with the people of Salta, and everyone we met during our stay was just as kind and welcoming as this man. 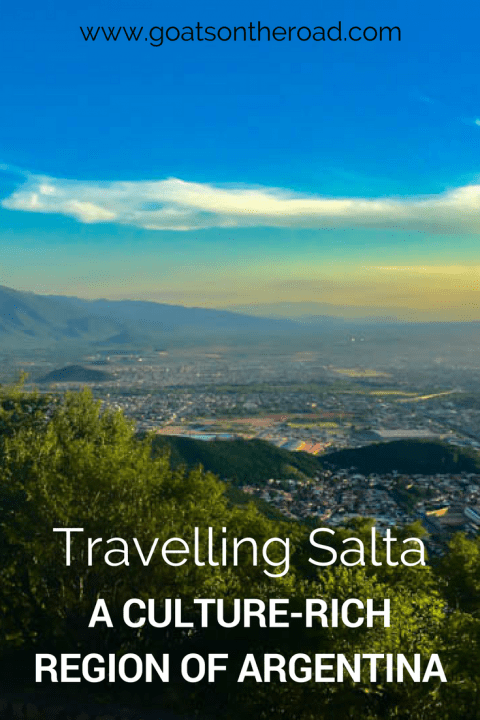 Set at the foothills of the Andes mountain range, Salta is at an elevation of 1,152m. The air here was very dry and any moisture in our skin was immediately sucked out as soon as we arrived. But, the sun was high and the sky was blue. We couldn’t have asked for better weather at the end of January, which is the month with the highest rainfall. In the light of day, we set off to explore the city and were in awe at every turn. The walk to the main plaza and all of its sights was just as aesthetically appealing as the actual plaza itself. In particular, we couldn’t get enough of the San Francisco Church. When we later found out that there is a statue of San Roque here (the Patron Saint of dogs), we loved it even more. Every August, the church is filled with well-groomed dogs who are blessed by the priest, to celebrate San Roque. The dogs receive a little red ribbon around their necks and carry on with their blessed year! Funnily enough, during the free walking tour we had a beautiful stray dog with us the whole time, who even came into the church with us. I guess she didn’t realize it wasn’t August. Towering over the main Plaza 9 de Julio was the ornate Salta Cathedral. This Baroque style, pink, Roman Catholic cathedral was gorgeous! We’ve never seen a pink cathedral before so we were immediately intrigued. 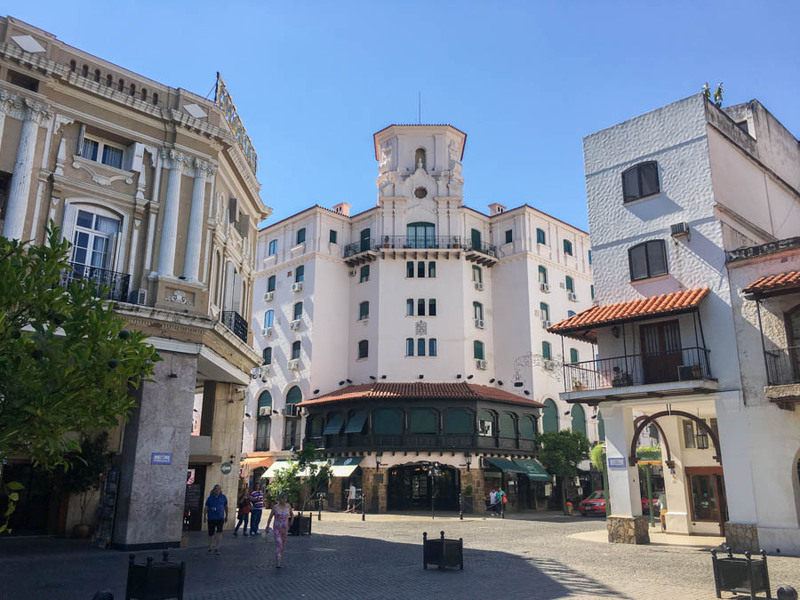 Surrounding the other sides of the main plaza were numerous museums, restaurants, hotels and shops, all set in beautiful buildings in neo-classical, baroque or French style architecture. 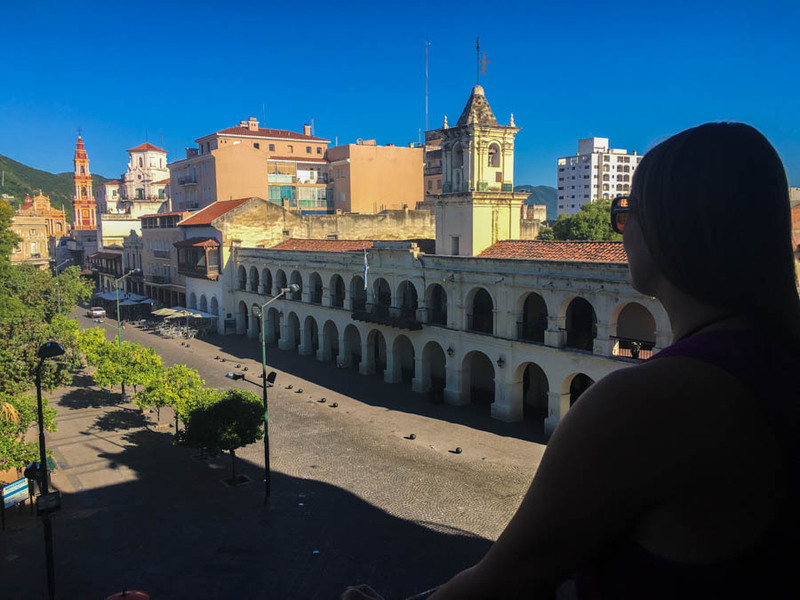 The balcony of the Centro Cultura America building gave us an incredible vantage point over the square and to the San Bernardo hill in the distance. But, no matter where we were in the plaza, the views were spectacular. 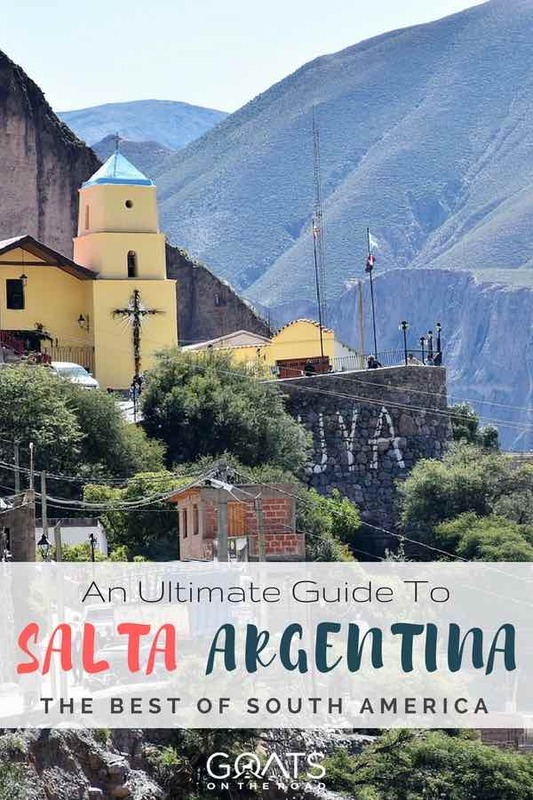 Salta is set at the foothills of the vast Andes mountain range, which spans along the border of Argentina and Chile. During the time of the Inca people, child sacrifice to the Gods was commonplace when there were important events or famine. Sacrificing a child was said to appease the gods, and only the healthiest, best looking children were chosen – provided they were between the ages of 6 and 15. They were dressed in their finest clothing and brought to the highest mountaintops before being given an alcoholic drink to minimize the pain. It’s a morbid thought, but an incredibly visceral experience to actually see the mummified children in person. Salta City has three of them in the Museum of High Altitude Archeology! The three children were discovered in 1999 on the top of Mount Llullaillaco (a 6,739m peak) by an expedition team. Because of the freezing cold conditions, the bodies never decomposed, and neither did the clothing they were wearing. Although there are 3 children in the museum, only one is shown every 3 months in order to ensure the preservation of the bodies. During our visit, La Niña Del Rayo (lightening girl) was on display. She was very small in stature and look like a doll. Her body was so well-preserved that it almost looked fake. These three children are said to be the best preserved mummies in the world. It’s definitely morbid and hard for us to understand why the Inca people would do this. But in fact, it was very common during pre-Columbian times across Mesoamerica, South America and North America as well. The museum provided us with a better understanding of Andean culture and their connection to the mountains. 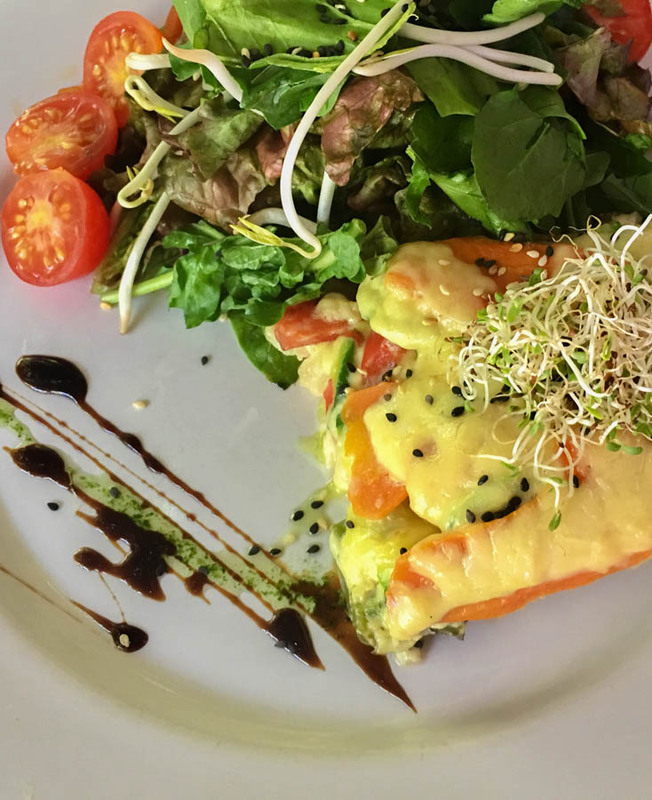 Both the Spanish and Indigenous cultures are very prominent in Salta, not only in terms of architecture and religion, but also in the food. 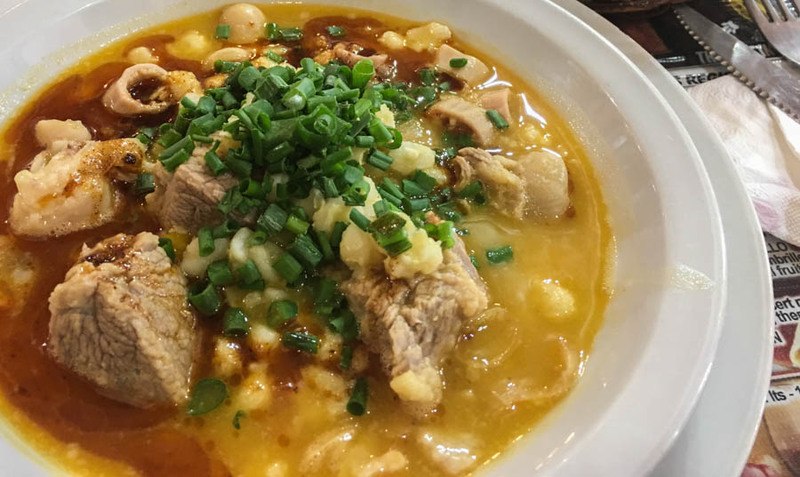 We had heard about a dish called “Locro”, which is from the Quechua language and is a typical Andean meal. We found this hearty stew at La Criolleta restaurant, which serves up traditional meals. The bowl was overflowing with chunks of stewed meat, white corn, beans and papa chola potatoes. It was thick and it was delicious. Our guide on the walking tour introduced us to an affordable restaurant serving up a mix of Andean, Peruvian and South American cuisines. The place was called Viracocha and we first went there for the menu of the day, but, we ended up returning to eat there 4 times during our trip to Salta! 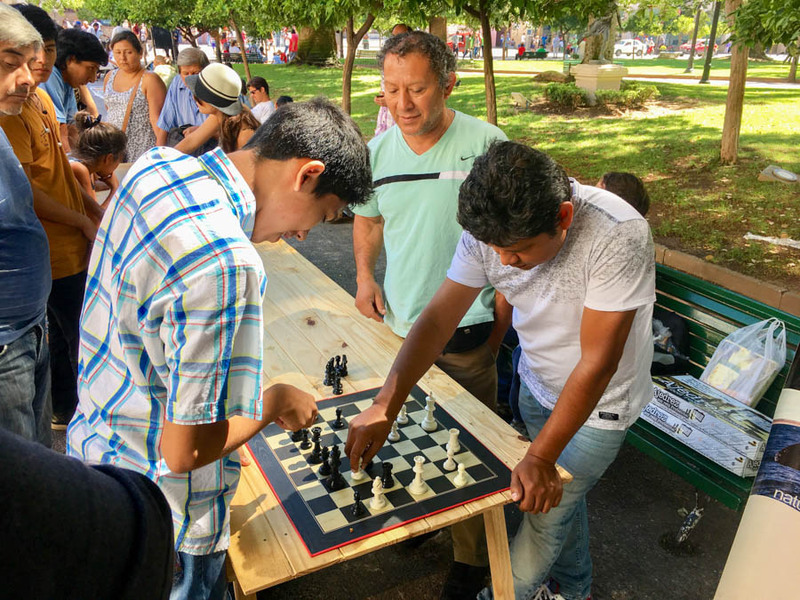 There was a whole page offering foods cooked in Peruvian ways, while using wholesome ingredients that are typical to the Andean culture and the region. During the course of our 5 trips to Viracocha, we dined on quinoa soup, vegetarian pasta, steak, pork, chicken, empanadas, and more. The sauces used in the cooking were unique, savoury, sweet and tasty. The mint infused lemonade was divine, as was the lentil starter with buns. We were always stuffed and satisfied after our meal, and thankfully, it wasn’t hard on the wallet. For our final day in Salta, we decided to tackle the San Bernardo hill. You can opt to take the cable car, drive, or hike up the 1,000 + steps. We opted to get some exercise and made our way up the hill for sunset. The hike was actually pretty exhausting, but worth it for the scenery. 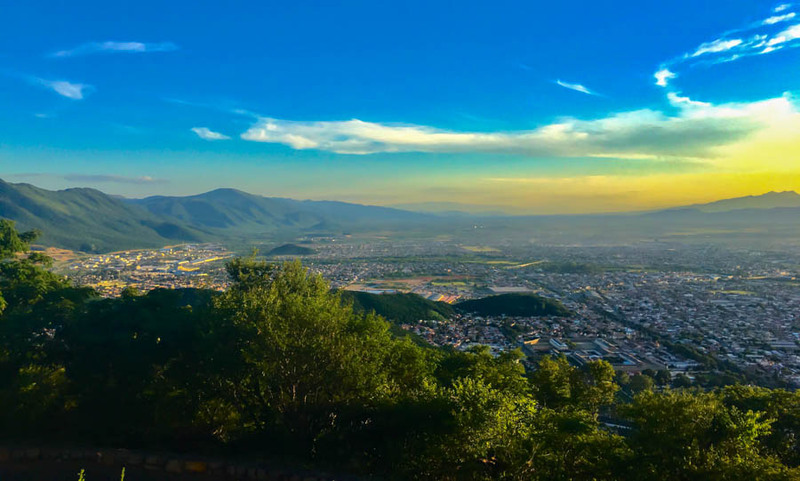 Initially, the view we saw was covered by some trees and not all that impressive but, we then realized that the view closer to the cable car was better and we were rewarded with an awesome panoramic view of Salta. 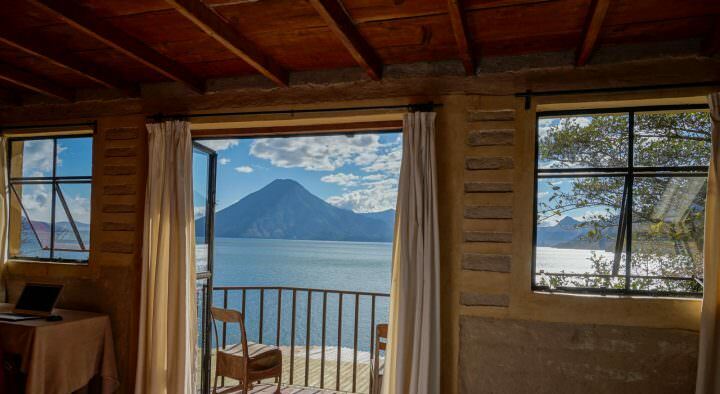 We stayed at Posada del Angel and loved it! The location is excellent, the staff are very sweet, the room is massive and a so-so breakfast is included in the price. The wi-fi works well and the rooms have a/c. 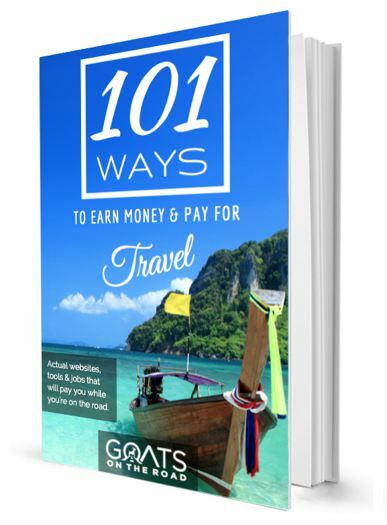 Click here to book with booking.com. A Taxi from the airport to near the main plaza costs 170 pesos ($10). The Museum of High Altitude Archeology costs 100 pesos ($6.30) to enter. Restaurant New Time is located in the main square and is a great place for people watching and a drink. Viracocha Restaurant was our favourite with the menu of the day costing 150 pesos ($10). It includes a starter, juice, appetizer and a main course. It’s big enough to share with 2 people. 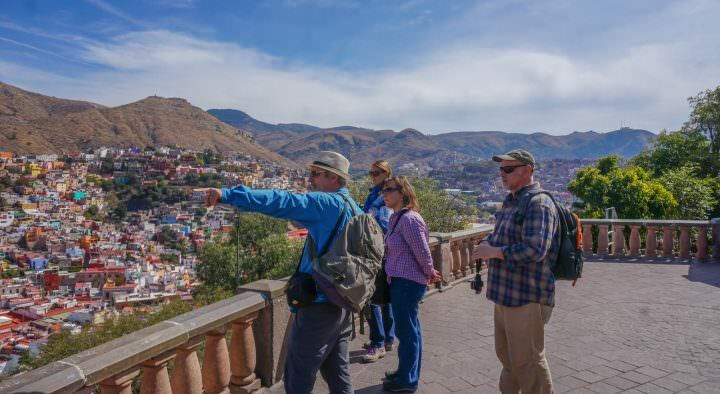 Check out the free walking tour (Salta Free Walks) for an informative and interesting walking tour around the city. The cost of the cable car up to the San Bernardo hill is 150 pesos ($10), return. We felt safe the entire time in Salta so there’s no need to be overly cautious. There is a Carrefour grocery store in the city, which is a great place to stock up for a road trip. Buses to Mendoza are between 18 – 19 hours. There are numerous companies to choose from. After our road trip, we bussed from Salta to Mendoza with AndesMar. The cost was 2,079 pesos each ($135), there was free wine and (bad) food onboard. Note: No portion of our trip in Salta was sponsored. We paid our own way and wanted to share our tips, advice and recommendations with you 🙂 We hope you find our content useful! If so, we’d love it if you could comment below and share it on social media. Thank you! Thanks for the informative post. How do you guys choose your route? No Mendoza? I mean, how do you eliminate places? Oops, I meant no Córdoba…. not Mendoza. Reading about your adventures is always so refreshing. 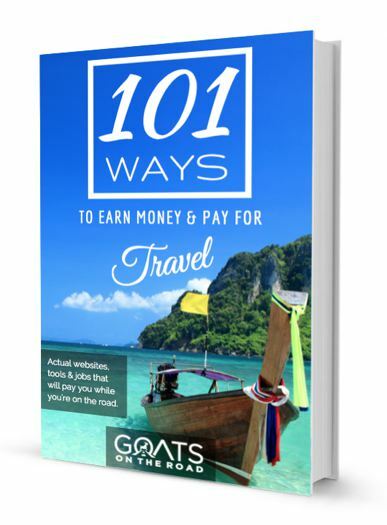 You cover so many places outside the typical tourist traps. And thank you for providing photos of the things I would care to see: food, accommodations, the people. The surrounding beauty is always breath taking. What a blessed life you share! Thank you! Hi Angela! Thank you so much for the lovely comment We really appreciate it! Happy travels. 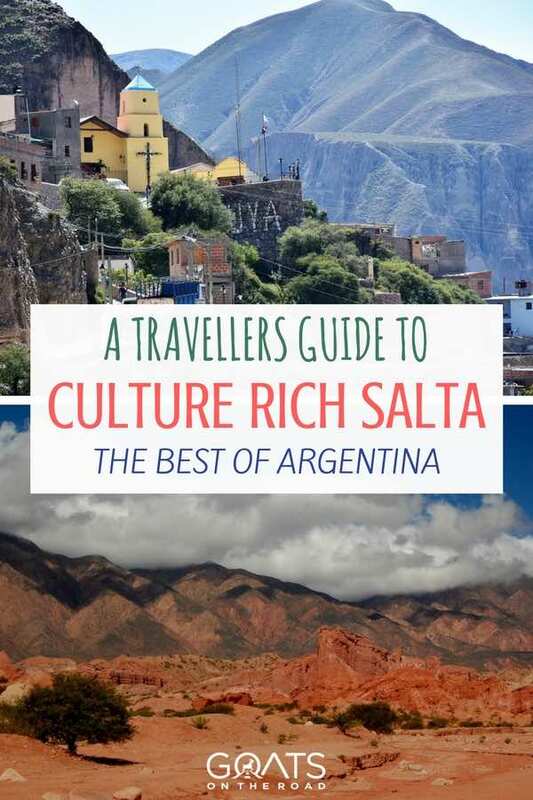 Great review about Salta guys, Thanks a lot for doing it. Thank you for sharing it and for mentioning us. Best of all on your journey. 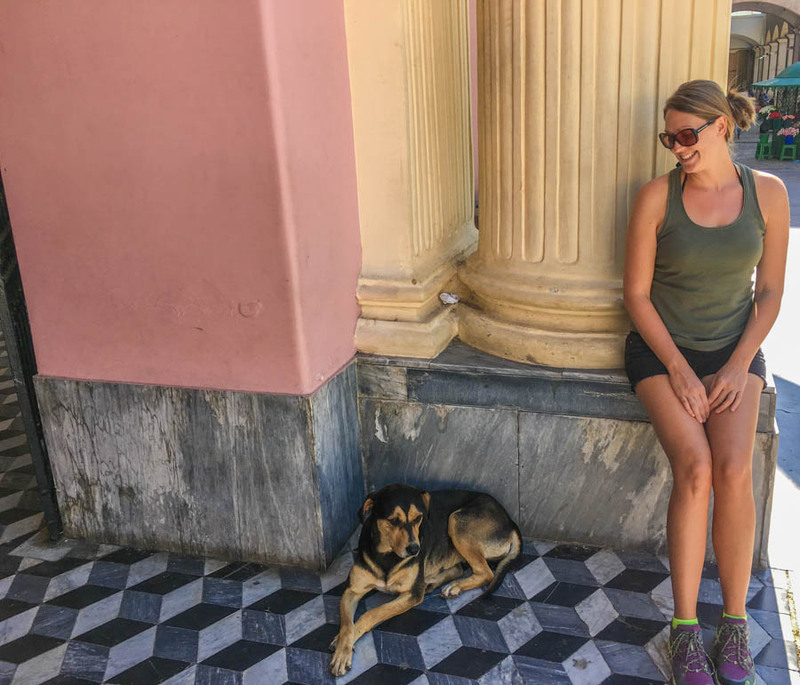 Is Argentina safe for lone-travel woman? 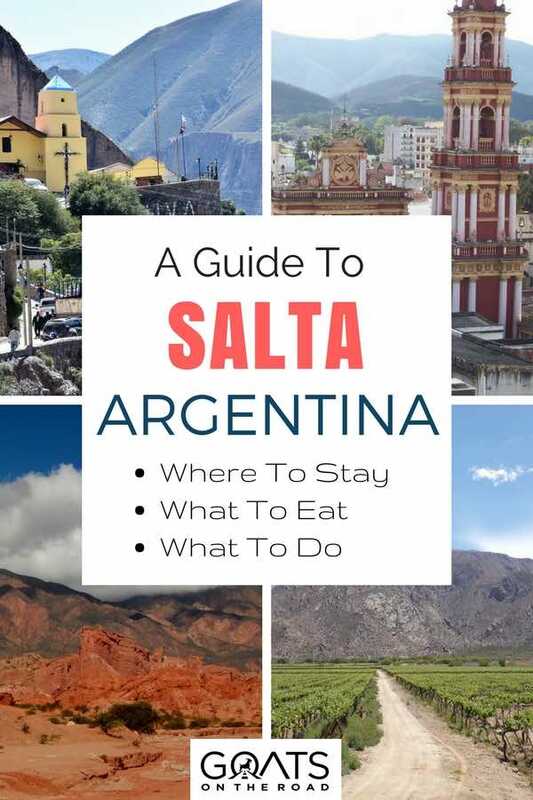 In salta now and looking forward to checking out your recommendations. Thanks as always.